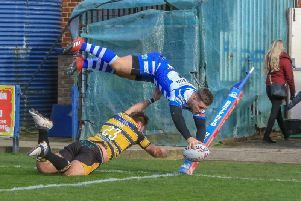 Halifax coach Richard Marshall has admitted he faces some “difficult” selection decisions ahead of Sunday’s Challenge Cup date with Castleford amateurs Lock Lane (3.0). Fax go into the game gunning for a place in the draw for round six - alongside the biggest names in Super League - which will be broadcast live on BBC Radio 4 at 8.30am next Thursday. Marshall had been expected to make a raft of changes to his team for a game the home side will start as unbackable favourites, but the situation has been clouded by last weekend’s shock 38-35 home loss to Swinton in the Championship. Several players - notably full back Miles Greenwood and winger Will Sharp, who saw opposite number Liam Marshall run in four tries - are in the spotlight after that contest, leaving Marshall facing some tough choices. “There will be changes and there would have been changes anyway, regardless of what happened against Swinton,” said Marshall, who has a wealth of backline options, with Tommy Saxton, James Saltonstall and the fit-again Gareth Potts all waiting on the sidelines. “It is difficult, and whatever we do people will read into it whatever they want. “Will wasn’t at fault for all those tries, but we are all accountable, aren’t we? “Wing and full back are exposed positions; as a winger, you might expect to make between zero and 10 tackles in a game, but you need to make them, otherwise you concede tries. “A front rower might make 35 or 40 tackles, but if you miss one, it’s not as costly; that’s the pay off. “We rested Tommy last weekend, so he could come back in, James has had a bit of a sabbatical and Gareth’s fit again.